Hello! 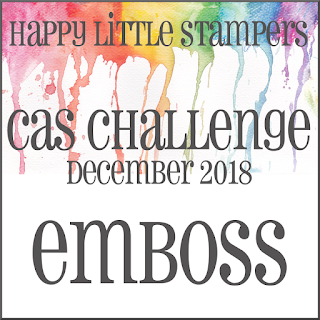 Just playing with some patterned paper, embossing folder, dies, and cardstock. 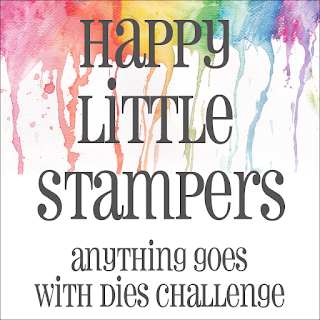 No stamping involved in the making of this card. I embossed a strip of All Spruced Up CS(GKD) with Darice Pine Branches EF and added some color to the pine cones with Krylon Gold Leafing Pens and added Perfect Pearls to the other raised surfaces of the branches. I die cut a Branch with Impression Obsession die and words with Cheery Lynn dies from the same green CS and attached all to white CS layered with Patterned Paper from my stash. 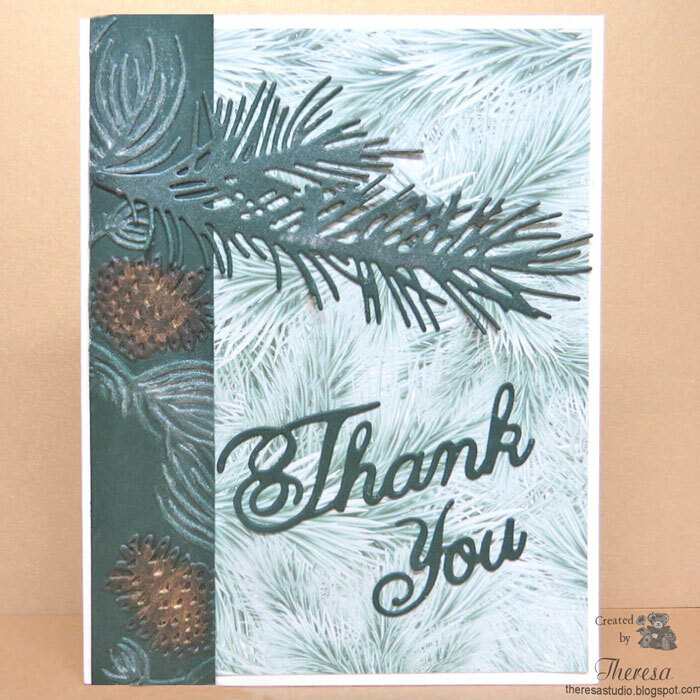 I was pleased with this Winter Thank You design. Welcome! 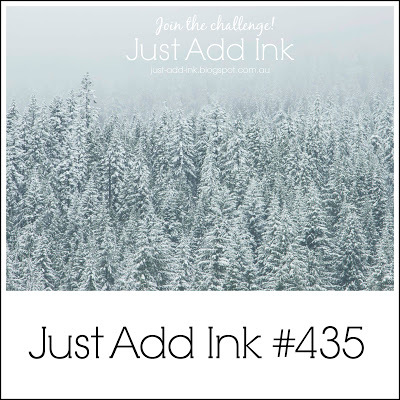 I was inspired by the snow globe shown on the mood Board at Double D Challenges and created this card using stamps from Repeat Impressions for the snow globe and the snowflakes inside the globe. 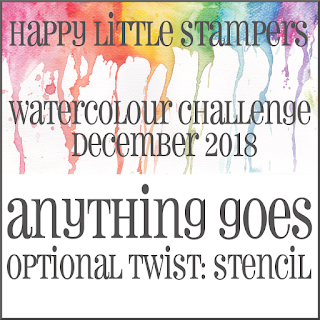 Used a sentiment from a stamp set from Simply Cards (2017)freebie. What would be as lovely as a Snowglobe filled with Glittering Snowflakes? Other Supplies: Versamark Ink, Gold EP, Gold marker and pencil, White EP, Memento Summer Sky Ink, DOI Salty Ocean, Snowflake Die, Circle Die. White CS, Patterned Paper from stash. Hello! 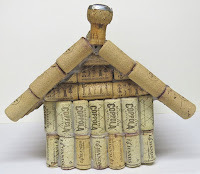 Took some time out from paper crafting to do some crafting with Wine Bottle Corks. I made this Bird House with corks and a hot glue gun following a design that I saw on Pinterest. 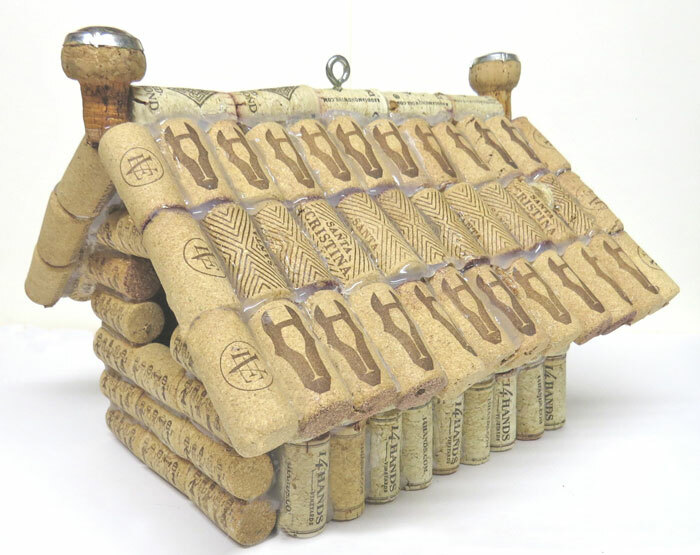 We have collected a LOT of corks over on the years and I am always looking for ways to reuse. Have made wreaths, caroling angels, trivets, bulletin boards, etc but this new project used a lot of corks....about 169-I counted. I used a lot of glue to make sure it holds together and added a screw eye for hanging. I plan to make the entry hole smaller but still working on that. 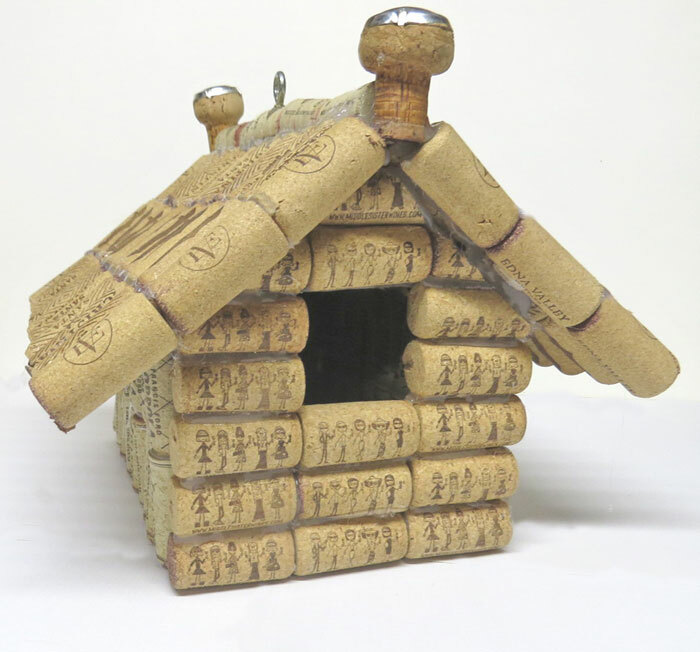 It should be only 1.25 -1.5 inches for smaller birds and to keep out the larger birds and predators. Below photos show the sides and back. 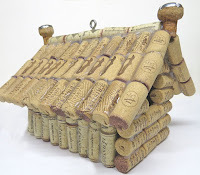 Now I have to decide if I will hang this outside for the birds in the spring. 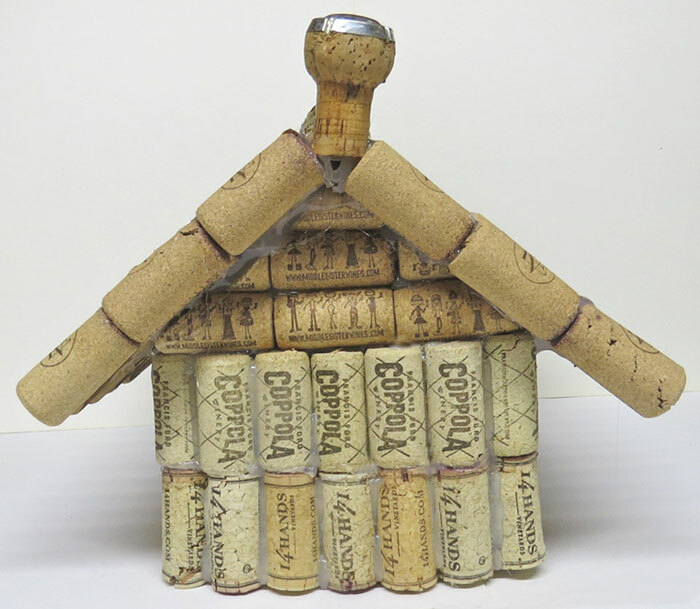 If I make another one, I will include an opening so the house can be cleaned after use by a bird family. Have a great day! I think I will go uncork another bottle of wine and start saving for another project. Hello! 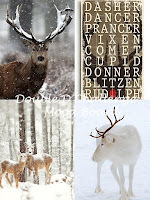 I am still creating Christmas cards even though the I have mailed all my cards this year. 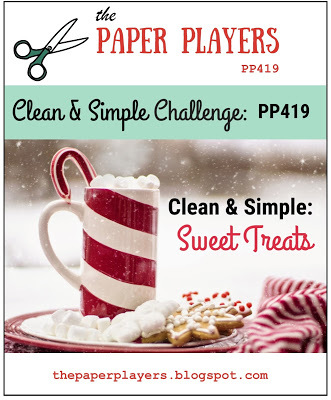 I still am inspired by some new products to create this design with freebie dies from a magazine. In fact all the elements of this card are from die cuts from the free set...no stamping involved. 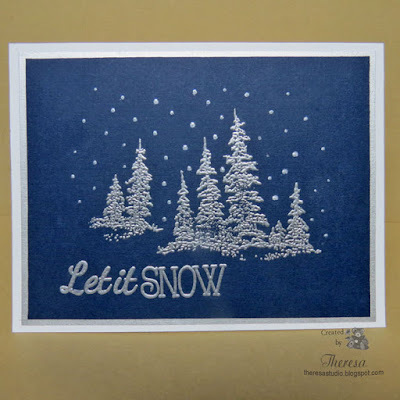 Sponged a white card base with Memento Summer Sky ink and added a layer of textured watercolor panel for the hill and then the trees, snowflakes, deer, and words. As an afterthought, I added the die cut squirrel in one of the trees. 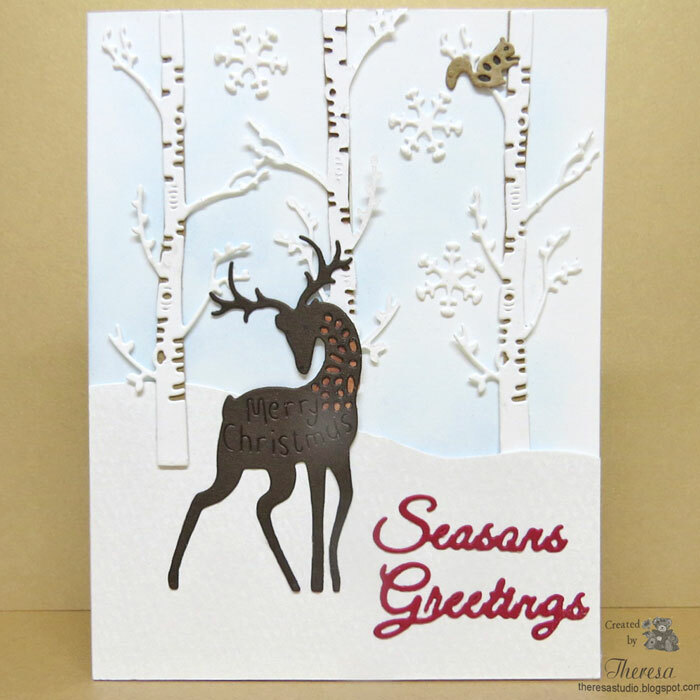 I lined the deer, squirrel, and trees with contrasting cardstocks which added more dimension. 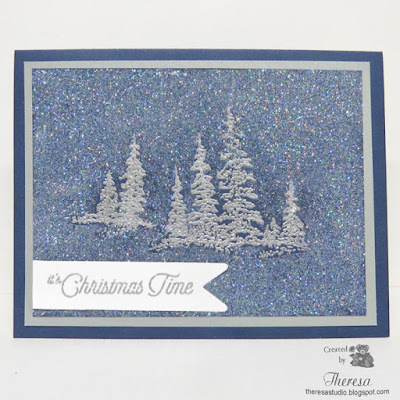 Sharing a couple of Winter / Holiday cards that I made with foil accented cardstock from my stash and used with Blue CS and Silver Metallic CS. The top card was finished with a precut and stamped topper and holly leaves cut with a GKD die. 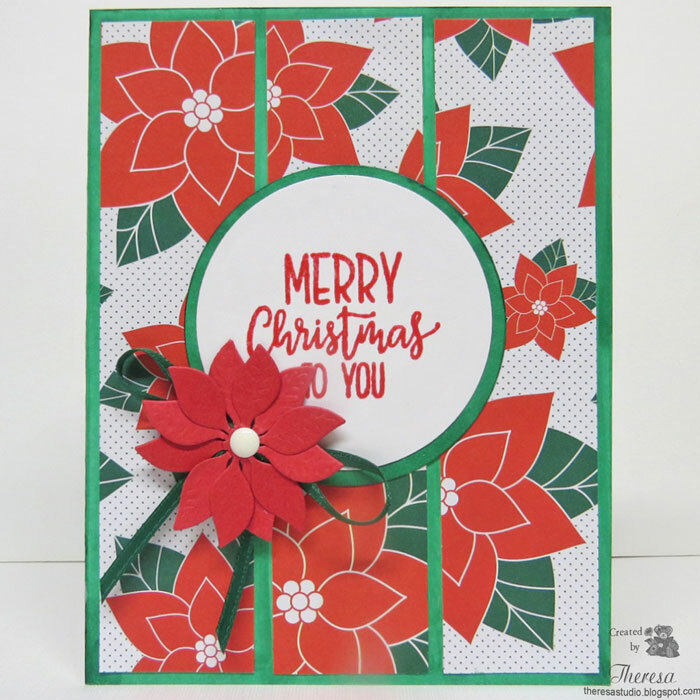 The second card uses die cuts and stamp from GKD sets. 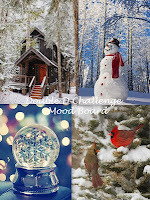 Mod Squad: Challenge is Christmas or Winter Project using a Metal Die. Hello! Christmas is almost here. 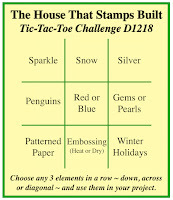 Just had to make this Christmas card for the Inspiration Palette D1918 challenge at The House That Stamps Built. 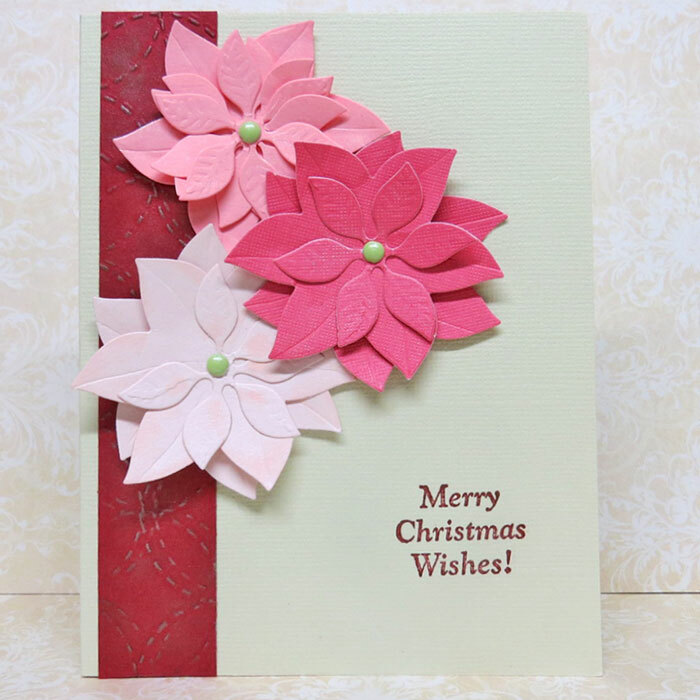 I used Creative Dies Poinsettia Nesting dies (a freebie) with various pink card stocks to create Poinsettias with Green metal brads. 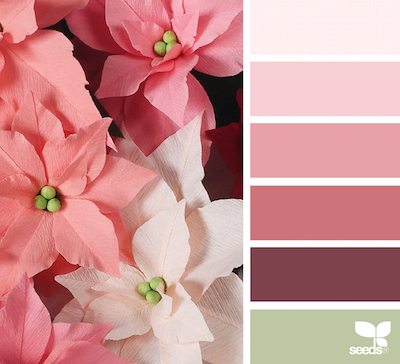 I rubbed Perfect Pearls on the petals for some shine. I attached the flowers to a Mint Green Cardstock (Brazzill) layered with a strip of embossed Cranberry CS. I finished with a Repeat Impressions sentiment stamped in SU Bravo Burgundy ink. 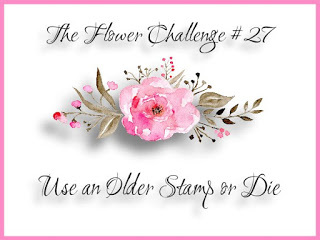 The Flower Challenge: #27 Use older stamp or die. Dies are a couple years old. Hello! 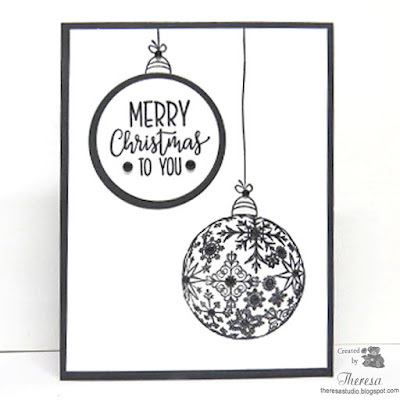 Today I have 2 versions of a Christmas card using Repeat Impressions Snow Flakes stamps and a sentiment stamp from Ornaments and Snow Globes series. I stamped the Snowflakes and sentiment with Versamark ink on Blue CS and heat embossed with WOW Silver EP. I inked the edge of the panel with Pilot Silver Metallic Marker and attached to white card base. 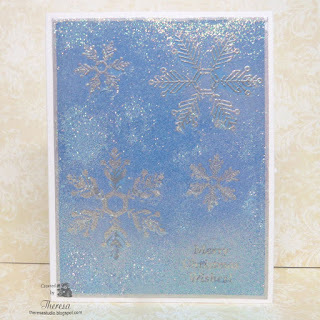 Love the details of the snowflake stamps with the sparkly silver embossing. 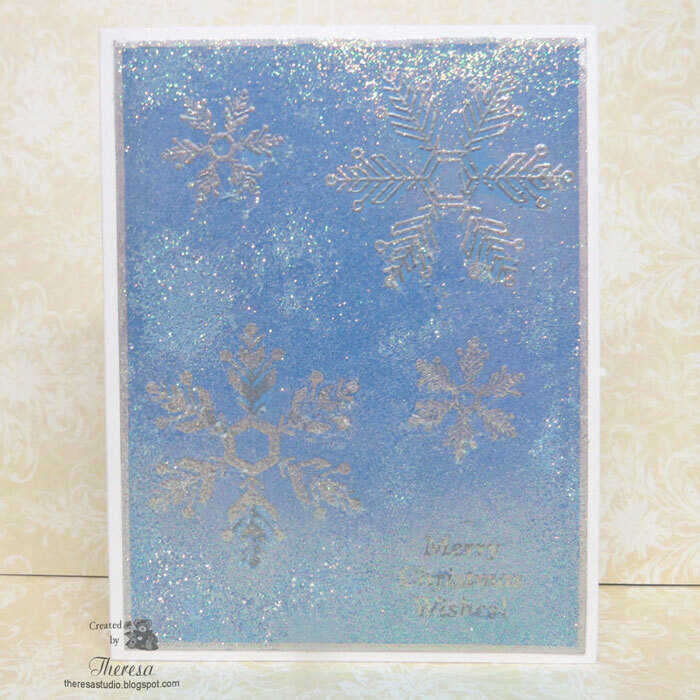 For the second card, I repeated all the steps in the above card but added Ultra-fine Crystal Glitter on the panel with double side adhesive paper. It's a bit hard to see the stamped elements in the photo. But it's a very glittery card! Hello! Today I have a simple Christmas card made with a digital image from my files....not sure of the source but think it was filed under Prairie Fairy. Colored in red, greens, and browns(Kraft). GKD sentiment stamped with Memento Rhubarb Stalk ink and used card stocks of Kraft, Green, and white. Love the scene of Santa feeding the baby deer. Cards in Envy: The Spirit of Christmas. 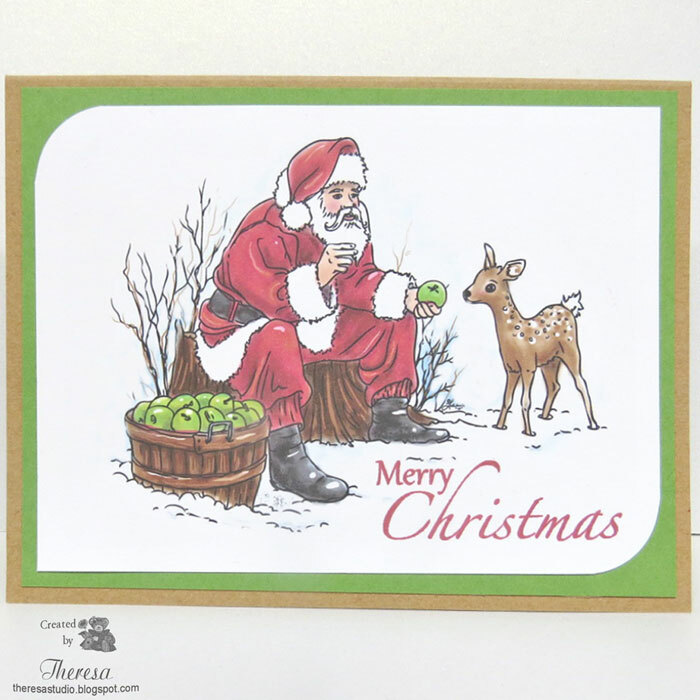 Card depicts the spirit of Christmas giving and fits into envelope. 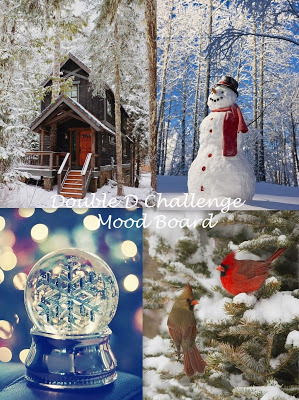 Double D Challenge: Run, Run, Rudolph. 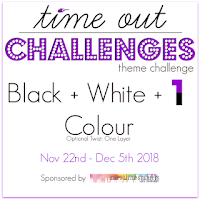 Just had to enter this cute deer in the challenge. Hello! 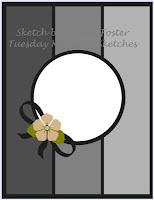 Back with another wreath card -this one in Black and White. I used Gina K Design stamps from the Holiday Wreath Builder with Memento Tuxedo Black ink. Added rows of black gems and pearls to finish the card. 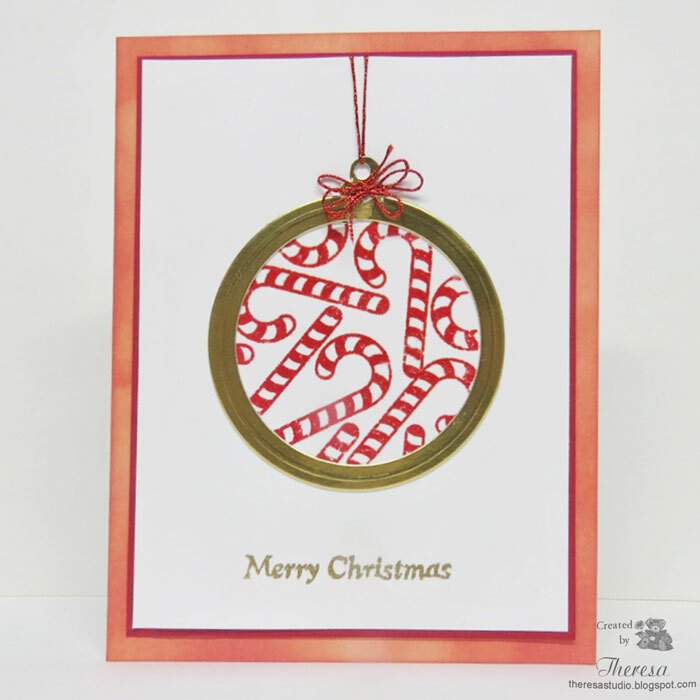 Used circle dies to trim the wreath and add a frame of black CS before attaching to white card base. 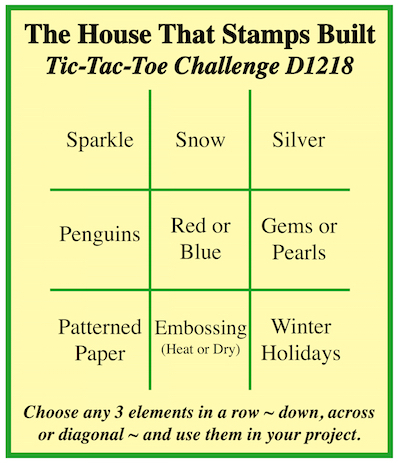 Modsquad Challenge: Build a wreath card with small stamps. 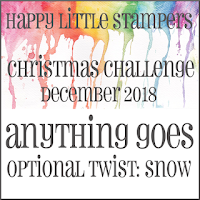 Craftyhazelnut's Christmas Challenge: Anything Christmas goes-optional theme add gems or pearls. Hello! 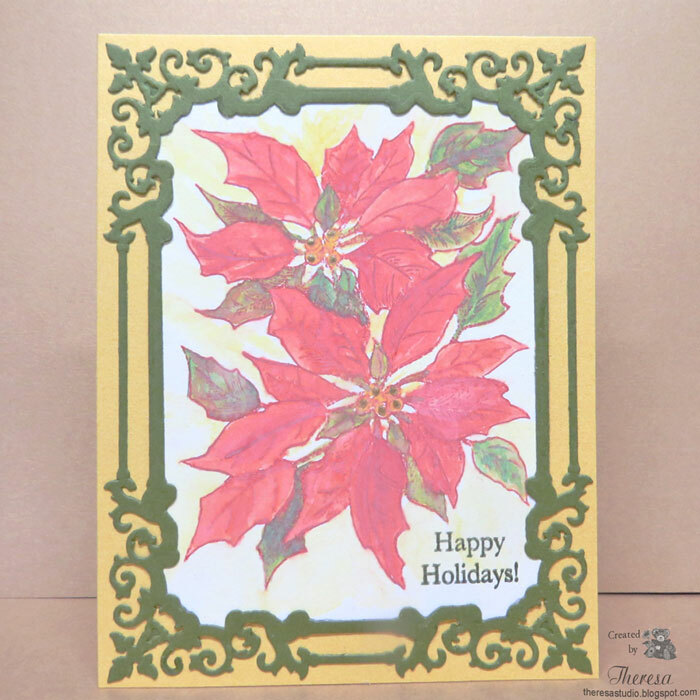 For this card I have used one of my oldest and favorite poinsettia stamps from PSX. I think this may be the first time that I water colored it. I used Distress Oxide ink Fired Brick to stamp the image on watercolor paper and used a water brush to color with Fired Brick, Lucky Clover, Peeled Paint, and Fossilized Amber DOI. I added some highlights to the center of the flowers with a Metallic Gold Gelly Roll pen. I used Spellbinders Regal Frame dies to cut a frame from Fresh Asparagus CS and used a Shimmery Yellow Pearl CS as the card base. The sentiment from GKD was stamped with SU Always Artichoke ink. The Flower Challenge: Challenge #27 use an older stamp or die. The stamp is dated 1992 so I know it is an old one. 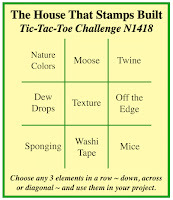 The die that I used is about 3 years old. Welcome to my studio! I made some Hanukkah cards which I mailed out last week. 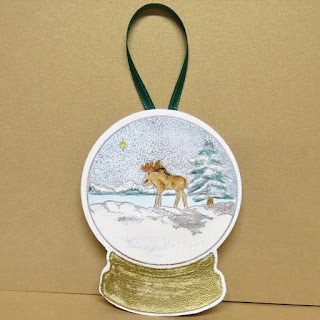 I am sharing this one that I made using stamps from Gina K Designs Holiday Wreath Builder set. I stamped the Star of David and sentiment with Memento ink. The circle design around the sentiment was heat embossed with gold EP. I added the Gold Dreidel cut from Gold Metallic Cardstock with a Quick Kutz die. 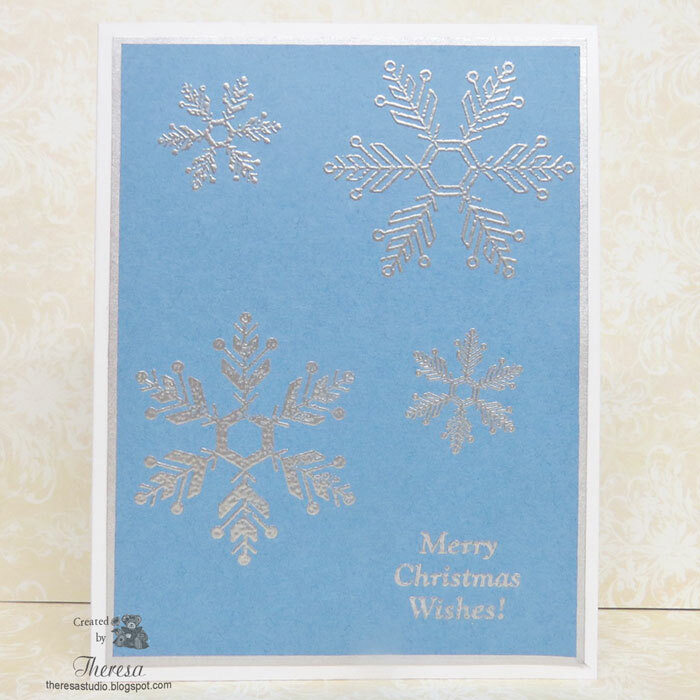 Used GKD Powder Blue and White Card stocks. Note: The Star of David Stamp is missing in action. I hope it turns up in the studio but I have searched everywhere. I love the size of this stamp. 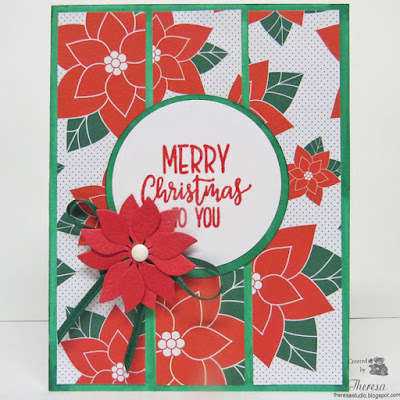 Mod Squad Challenge: Build a Wreath Card with small stamps. Die Cut Divas: December theme is Winter/Winter Holidays. Welcome! 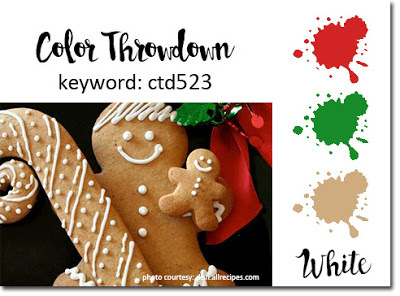 Today I am sharing a couple of creations that could be use as hanging ornaments or tags on gifts. They both were made with Repeat Impressions stamps from the Ornament and Snow globes set. I used circle dies for cutting. 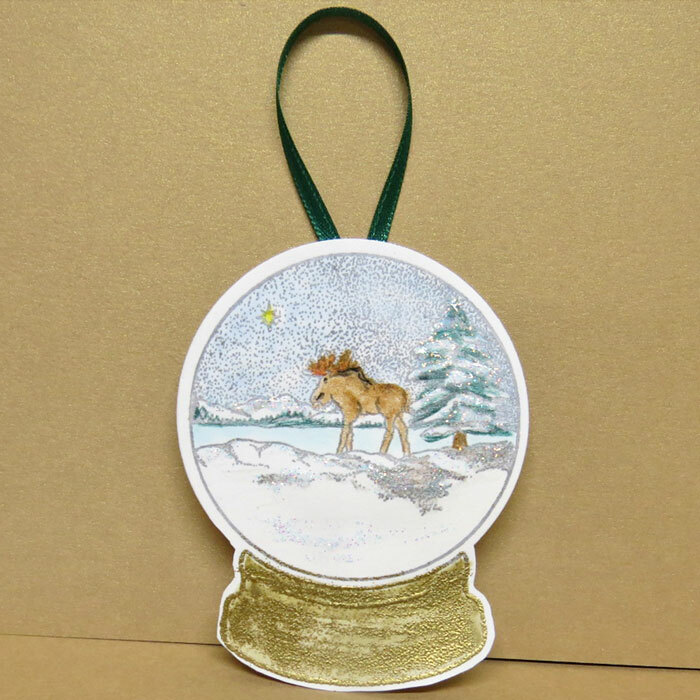 The top tag with the scene of a moose in the snow was stamped with Memento ink and Versamark and colored with pencils and Copics, Added some sparkle with Diamond Crystal Stickles.The base was heat embossed with gold EP. Added a Green satin ribbon. The next tag with Candy Canes was stamped with Versamark ink and heat embossed with Red EP. 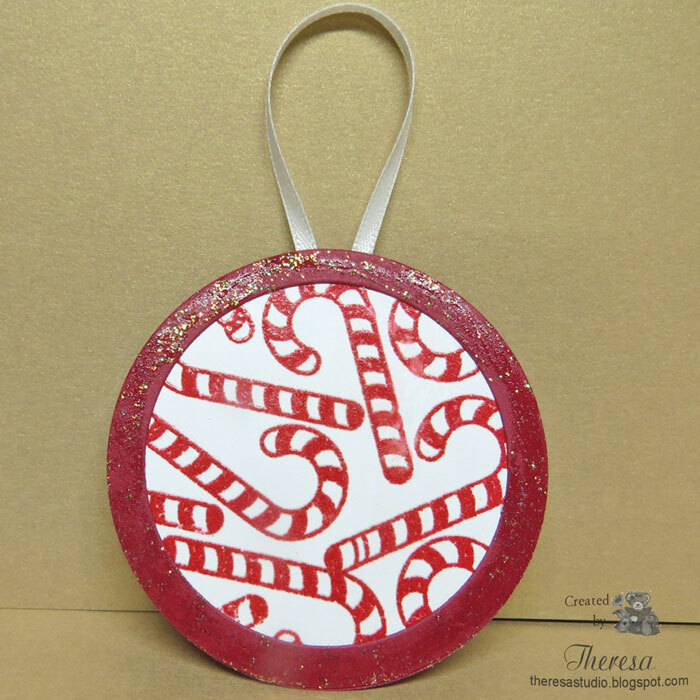 I added a frame of Red CS die cut with circle dies and added the stickles for sparkle. Finished with a White satin ribbon for hanging. 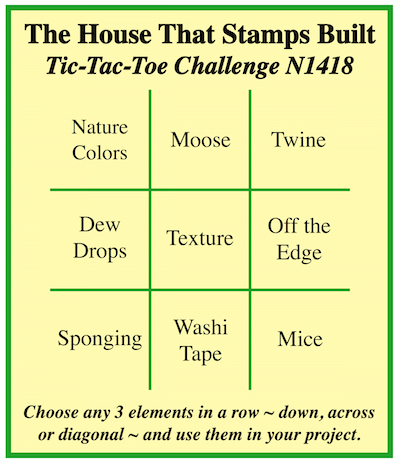 The House That Stamps Built: DCC215 Anything but a card. Double D Challenge: Run Run Rudolph. I used a moose instead of a deer which is acceptable. Have a great day! I love reading your comments. Hello! 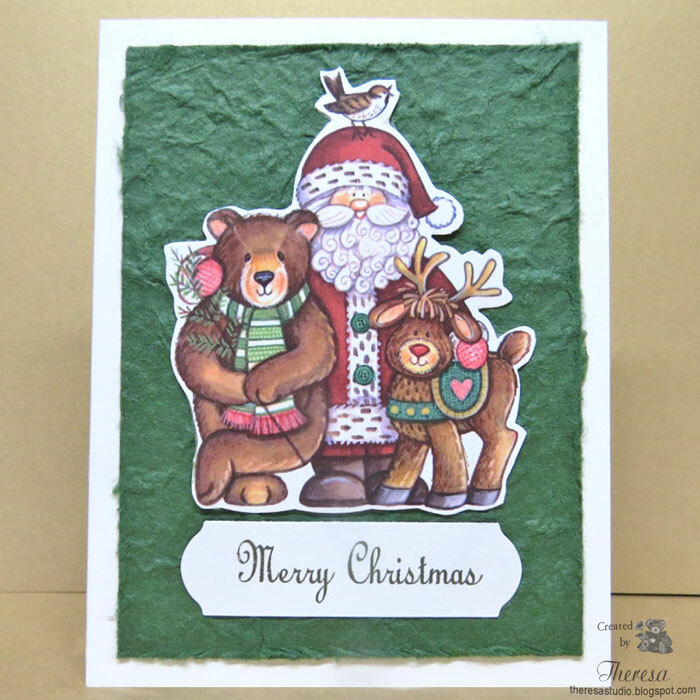 Today I have a card made using a print out from a file of PC Hug Art showing Santa with a Bird, Bear, and Reindeer. I fussy cut the image printed on white CS and attached to a panel of Green textured handmade paper. 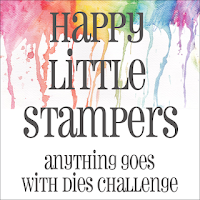 Added a stamped sentiment cut with a Spellbinders label die. 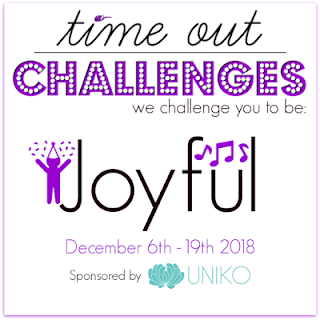 Simon Monday Challenge: Simon says B is for? I say B is for Bear and Bird. Hello! 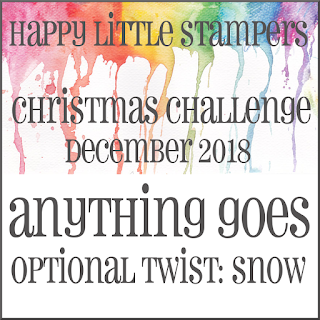 I was playing with the Monthly Mix challenge at Stamp TV Holiday in Black and White and created 2 cards with Gina K Designs stamps. The top CAS card features the ornament from Merry and Bright set and sentiment from Holiday Wreath Builder. 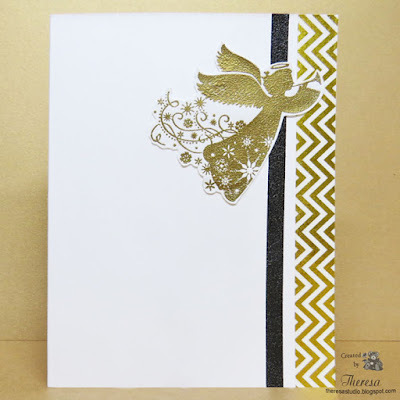 Stamping was done with Memento Tuxedo Black ink and heat embossed with Clear EP. Added several Black Gem stones to complete the card. 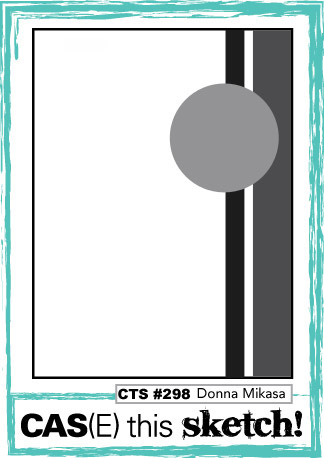 Other supplies: Black and White CS, Nesties Circle Dies. 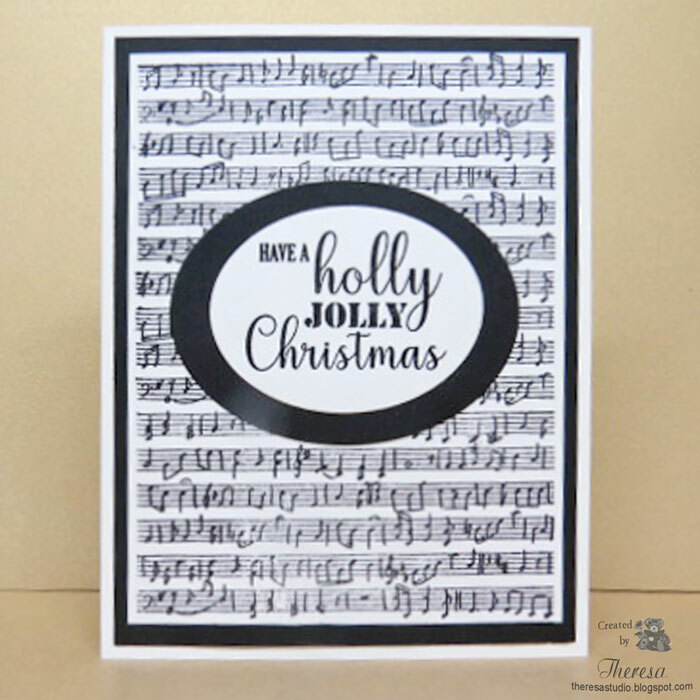 The background of this card was stamped using GKD Music Background. I attached the background to a black mat and a white card base. The sentiment was from Merry and Bright set. 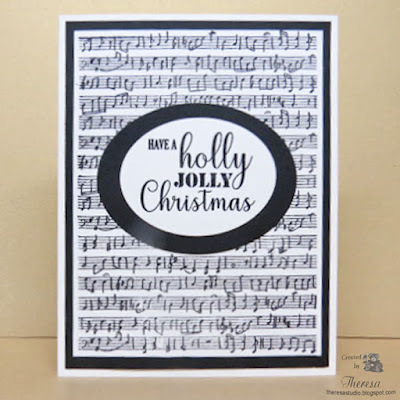 Used the same inks, embossing powder, and papers as above with oval dies. 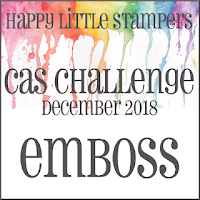 Happy Little Stampers: December CAS Challenge-Emboss-used heat embossing. Hello! 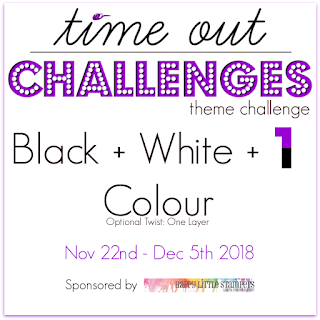 How quickly November went by! My card today was made with a lot of glitter! 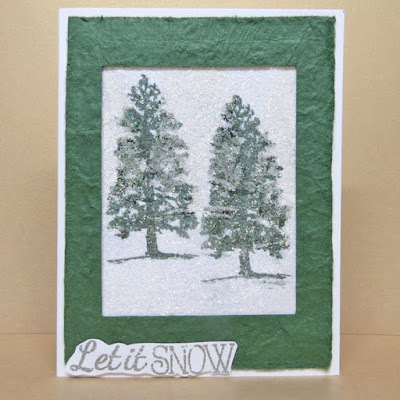 I used a tree stamp from Gina K Designs Northwoods set which I actually stamped twice in the background with Versamark ink and heat embossed with Clear EP but that layer got lost when I stamped the trees with green Memento inks in the foreground and added a layer of Crystal Glitter using a double sided adhesive paper. So much for my original design.....the card evolved into another look. To the glittery image,I added a frame of green handmade textured paper from my stash and adhered to a white card base. Finished with sentiment embossed with silver EP that I fussy cut. 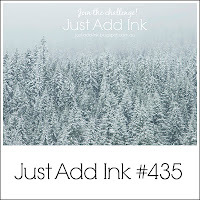 Crazy 4 Challenges:C4C 463 Create a card that features a tree.